Our reputation in the market is largely attributable to our precision-designed Horizontal Openwell Submersible Pump. 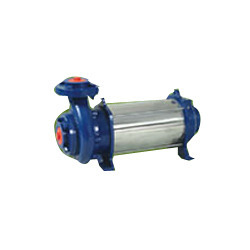 These pumps are manufactured using excellent quality raw material and latest technology by our skilled professionals. In order to ensure quality, these pumps are stringently tested on various parameters by our experts. Apart from this, our pumps provide dynamically balanced rotor and statically balanced Impeller for better efficiency and frictionless working. The offered range can be availed from us at affordable prices. Incorporated in the year 1996, we, “Jalganga Electricals”, are well-recognized manufacturer, exporter and supplier of a wide range of Submersible Pumps and Spares such as V3 Submersible Pump, V4 Submersible Pump, V6 Submersible Pump, Horizontal Openwell Pump, Submersible Pump Spare, Pump Spare. We are an ISO 9001 certified organization. The offered products are processed using high grade basic material and latest technology. The raw material is procured from trustworthy vendors of the market. The products we offer are designed and developed as per the specifications of clients in mind. These products are widely appreciated for high efficiency, less maintenance, optimum performance, low noise, compact design, energy saving, high strength and long service life. The offered products are available in different specifications to fulfill the variegated needs of the clients within assured time frame. These products are also available in customer specified specification through our customization facility. Further, these can be availed by our customers through easy payment modes in most affordable price.